Synopsis (from Amazon): When newly single Sarah Peterson rents a cottage on Kit Roseberry’s country estate and swops cooking supper for rent, she isn’t expecting TV producer, Magda Holmes, to fall for Kit and his culinary skills, or offer him a slot on her TV show. Kit can’t boil water, but he’s got the look and needs the money. Magda is keen to go for a traditional feel, happy families, picnics on the beach and birthday teas, so Sarah - along with her two boys - finds herself as undercover cook, and an instant wife and family for Kit’s TV debut. But what will that do to Sarah's fresh start, her new man, ex-husband and the rest of her life? Is it a recipe for disaster or does it have all the ingredients of a great romance? Cooking up a Storm is a classic Rom-Com, and includes recipes for all the dishes cooked by Sarah and Kit. 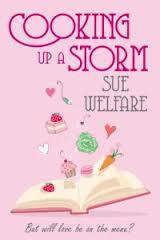 Meet the Author: I am so excited to bring you all this interview with author, Sue Welfare. Sue, thank you so much for taking the time for this interview! Thank you for inviting me. What a great place you’ve got here. I brought some banana bread and some blueberry cupcakes as I wasn’t sure what you’d like. I love autumn colors – burnt oranges, shades of brown, rusts and tans – I had my colours done a few years ago as part of a makeover for a book promotion, and the lady who did it said I should wear colours which are ‘ warm, deep and soft ‘ – which is also pretty much how I live my life! Food? Oh I love everything!!!! I love to cook, and so does my husband Phil – I’ve put on around 28 pounds since letting him loose in my kitchen. We often have friends over for supper and I like to cook big generous simple food that means we can concentrate on the company rather than the kitchen – so big stews with crusty bread or bowls of pasta and sauce or chilli and rice – this time of the year I love Italian meats served with salads and good bread. We currently have two dogs, Jake and Beau and I would love to have a cat, but we live close to a busy road and I think it would be too big a risk of being run over – and I’m not keen on the idea of indoor cats, so that idea has had to be shelved. I’m not very good at doing nothing. I sing in a local choir. I like to garden and grow my own vegetables (Phil does the flowers – I like to eat what I grow.) I make rag rugs and run workshops for other would-be rug makers, and the last few months I’ve started making mosaics – which is huge fun too. I like to read, and we walk a lot with the dogs. Oh and I’m just starting to learn to speak Italian after a great holiday in Sorrento. I love books, love stories, films, TV. I have been making up stories for as long as I can remember, but it took me ages to realize as a child that all those books I loved so much were written by a real live person, and as soon as I found out you could do that, I wanted to do it too – mind you, my other ambitions (aged about 7) were to be a teacher and run a shop where you got to weigh things! My first book was accepted for publications in the mid 90’s after I’d spent several years writing articles, freelance, for all kinds of magazines. I’ve got four sons and writing was a good way to be home for them while still building a fledging career. While they were little I’d write at night when they were in bed, and then later while they were at school before writing full time. These days I have a little office in the house, but it is very tiny, and Jake and Beau, our two dogs, like to be in there with me, so it’s more like a kennel with a keyboard! I always carry a notebook for jotting down ideas and notes when I’m out and about but my real writing is always done in the office. Oh yes - I write every weekday (and some weekends if I’m on a deadline or the story just won’t leave me alone) from around 8am till lunchtime. Mornings begin with admin and catching up on emails, and then editing what I did the day before, before starting on new work. After lunch I write till around 6 pm in the summer, 3 pm in the winter and then walk the dogs – they’re great company and the ideal companions to bounce plot ideas off. In the winter I’ll come back and do some more work, but in the summer I try and finish and get out of the office. How long have you got?! Thrillers are my first love – and I love the work, worlds and characters created by Karin Slaughter, Kathy Reichs, Lee Childs, Chelsea Cain & Carol O’Connell – but I read widely and feel bereft if I haven’t got at least one book on the go. Yes, mainly because I’m always writing something - although I read outside my genre, along with a lot of non-fiction. Karin Slaughter’s latest ‘ Unseen’ – she is just brilliant at creating complex, authentic, characters and I love how she revisits them – it’s a very compelling read. 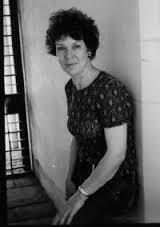 Thrillers, action adventure, detective fiction . Currently I’m in love with the Passenger Album: ‘ All the Little Lights’, but I love music, in my head my whole life has a sound track! Movie? The first one that springs to mind is ‘The Usual Suspects’. Kevin Spacey’s performance still lingers in my memory, years after I first saw the film. TV Show: Elementary; the American interpretation of the Sherlock Holmes story blew me away when I first saw it – nicely done – beautifully observed. Ocean/beach or pool – Ocean every time – and not just for the beach, but for the coves, the rocks and rock pools, and long bracing walks. Coffee or tea: Tea – lol - but then again I’m English! Fruit or candy: I’d like to say fruit but I adore chocolate…. A book or e-book: Both. Computer or tablet/smart phone: Computer – my fingers are way too big for smart phones and I hate the tiny screen. Camping or Hoteling: Hotels – and Apartments/ Villas. I camped for years when my boys were small and loved it, but now I’m older the ground seems a long long way down for sleeping and I really do prefer a decent bathroom! Driving or Flying: Flying – I love being above the clouds and seeing the countryside from a bird’s eyes view. Connect: Connect with Sue on Facebook. Purchase it: You can purchase Cooking Up a Storm online on Amazon for $13.99 ($4.49 Kindle version).